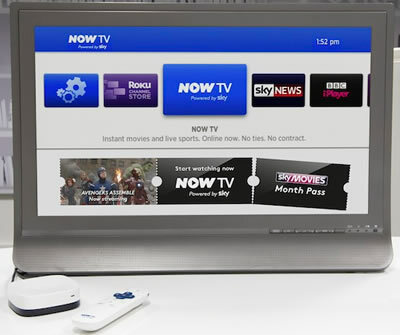 Sky TV seem to be on a mission to get satellite TV streaming onto the nations TV sets after launching an all new Now TV set-top box for a mere £10 ($USD15). The box which is a rebranded and modified Roku 2 XS is described by Sky as, “smaller than a beer mat” plugs into your HDMI port and brings the Now TV streaming service to any TV set. The box will also let you access other web based TV content including the BBC’s iPlayer service and Demand Five along with Sky’s new worldwide News channel, other apps such as Spotify and Facebook are also installed. As you may expect Sky have not included rival services from Netflix and Lovefilm in the box which is available now. Of course the main reason Sky are selling the product is to promote the Now TV service which offers Sky premium content on-demand and without a satellite dish or contract set-ups. The move is also seen as another response to rival BT who are offering free sports streaming via it’s BT Sport offer to broadband customers which it claims has already had 500,000 sign-ups. So a cheap way to entice new viewers to the streaming service that offers Sky Sports and Sky Movies on a TV set without any other hardware, satellite dish or subscriptions needed. Viewers will have to pay though, Sky Sports day pass for £9.99 and Sky Movies for a £15 monthly fee. Sky say they will be adding more “content and apps” over the next months. The move comes after Sky made an agreement with LG to include Now TV on their Smart TV range and just a day after Google launched the £22 Chromecast dongle. Shame that watching anything isn’t cheap. £9.99 for a sports day pass!!? ?